Chemical weapons were used on a relatively large scale in the Ghouta area of Damascus in Aug.21 attack, the UN investigators’ report says. 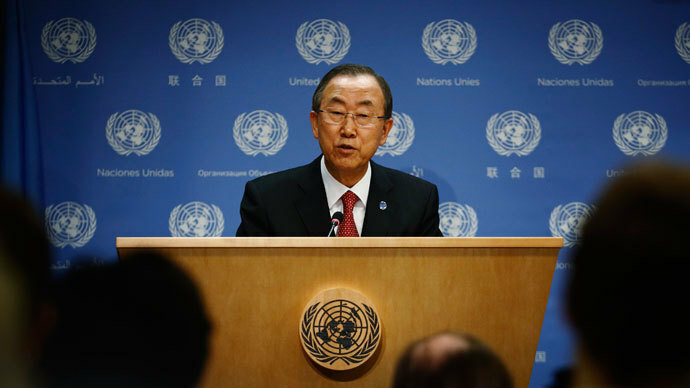 UN Secretary General Ban Ki-moon has submitted report at a closed-door meeting in New York. “The Mission has concluded that chemical weapons were used on a relatively large scale in the Ghouta area of Damascus in the context of the ongoing conflict in Syria. The attack resulted in numerous casualties, particularly among civilians,” Ban Ki-moon said in a statement published on the UN website. The UN Secretary General said the conclusions drawn in the report are “overwhelming and indisputable”. “The facts speak for themselves,” he added. The UN team’s report is based on interviews and eyewitnesses' accounts which investigators collected at the scene. The UN investigators spoke to more than 50 survivors, medical personnel and first responders. They also recorded individuals’ symptoms and took biomedical samples, including from hair, urine and blood. Local medical staff documented many patients' symptoms consistent with nerve agent exposure. A number were “were diagnosed with intoxification” and “clearly showed symptoms associated with sarin, including loss of consciousness, shortness of breath, blurred vision, eye inflammation, vomiting and seizures," the report said. All the samples the UN collected were examined at four laboratories designated by the Organization for the Prohibition of Chemical Weapons (OPCW), the report said. It has been revealed that 85 percent of the blood samples tested positive for sarin. The UN team said that almost all of the 36 patients who showed signs of poisoning tested positive for sarin. Environmental samples also revealed the use of sarin, the UN scientists said. "A majority of the rockets or rocket fragments recovered were found to be carrying sarin." The inspection team concluded that the munitions linked to one of the impact sites, called Site 1 in the report, matched types of the Soviet-made M14 artillery rocket, “with either an original or improvised warhead." The UN experts suggested that based on the “orientation and impact craters” and other damage in the area, the rockets were fired from an unspecified area to the northwest. 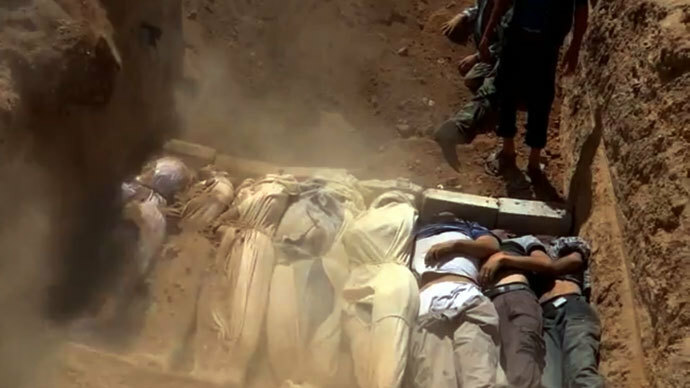 At the same time, the report does not say who those surface-to-surface rockets belonged to – rebels or government forces. However, after the presentation of the UN report, Samantha Power, the US Ambassador to the United Nations, said that she was convinced, based on the technical details from the inspectors, the weapons belonged to forces loyal to President Assad's regime. “Now the mandate of the UN chemical weapons team was, as you well know, not to investigate capability. But the technical details of the UN report make clear that only the regime could have carried out this large-scale chemical weapons attack,” Power told reporters at a news conference. Britain’s UN Ambassador Mark Lyall Grant also said that judging by the details, there was "no remaining doubt that it was the regime," Syria's government, not the opposition, behind the Aug. 21 attack with sarin gas. Russia, at the same time, said that the report is “very technical” and did not contain exact details or conclusions that would indicate the Assad regime was involved in the attack. Ban praised the mission, which he said “performed in battlefield conditions” and despite “difficulties and dangers” carried out a thorough investigation at the site of the attack in a limited time.